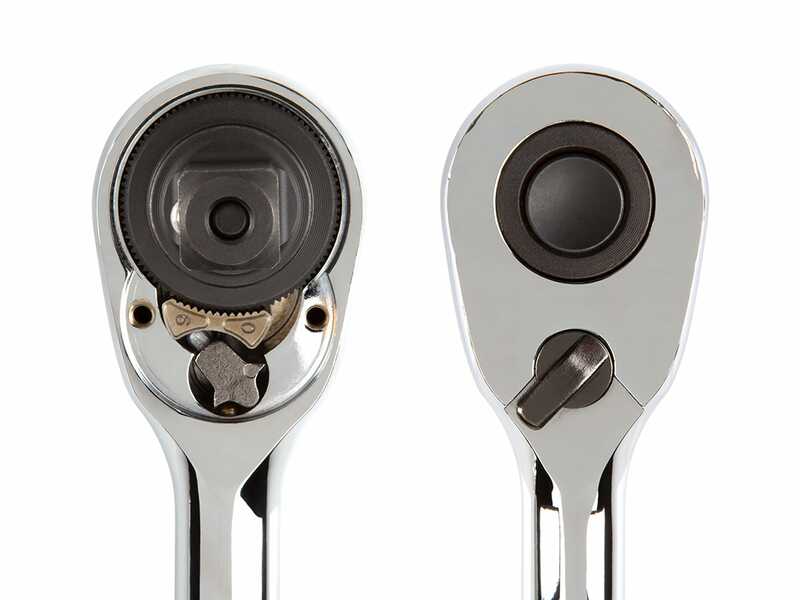 Smooth and refined, the 90-tooth ratcheting system offers a concise 4° swing arc that works in the tightest spaces. Depending on the drive size, the single half-moon pawl maintains 6 to 9 teeth (more than most dual pawl designs) in contact with the gear at all times, ensuring it will never slip or skip under stress. To aid the initial wear-in of mated parts and to keep them moving smoothly, the internals are lubricated with a few drops of light machine oil. 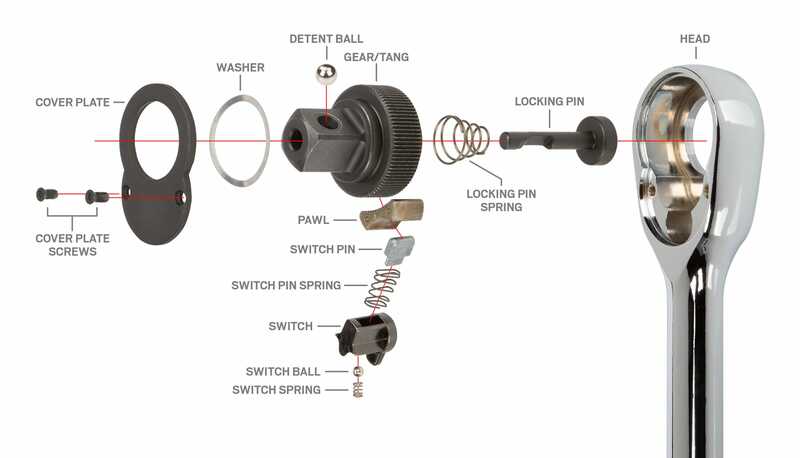 The design of the head and ratcheting mechanism allows it to be disassembled for periodic cleaning or lubrication. In most situations, access to tight spaces isn't limited by the thickness of the head because there's still the length of the socket or sometimes an extension to account for. Rather, it's usually a head that's too wide or too long that gets in the way. Unlike "low profile" designs that focus on controlling only the thickness of the head, we reduced the size in every dimension: height, width, and length. And most importantly, we did it without compromising strength. 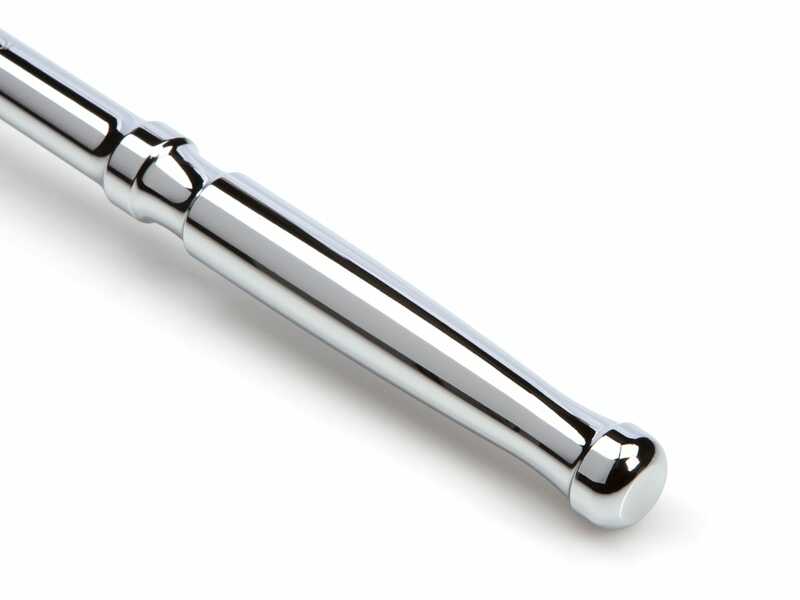 The drive tang engages and retains sockets with a detent ball backed by a locking pin. Once it's engaged, the socket is securely locked on—it won't accidentally fall off or be pulled off by sticking on a fastener. 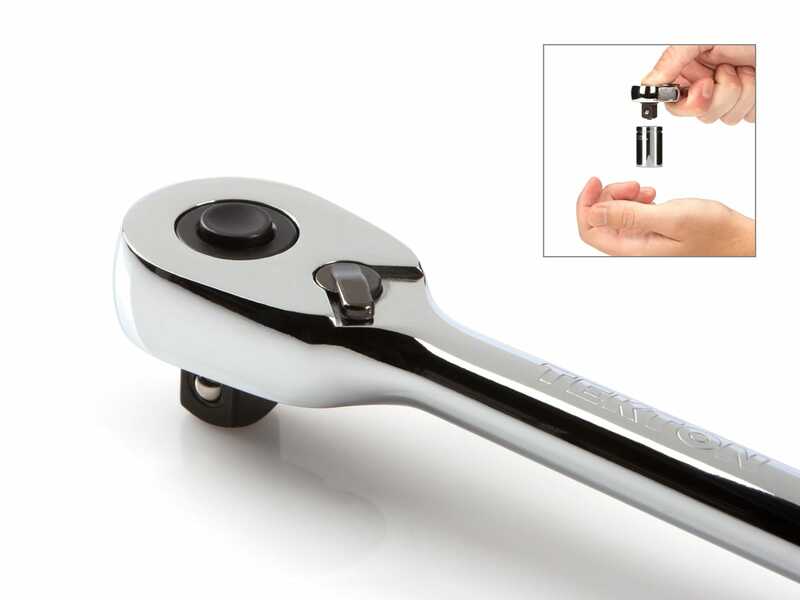 Pressing the release button drops the detent ball out of the way so sockets can effortlessly slide on to or simply fall off the drive tang, even making a one-handed socket change possible. Available in short, regular, and long (options vary by drive size), there's a handle length for every situation, whether you need something small for a tight spot, an all-purpose performer, or extra reach and leverage. To be clear and consistent about the size of our ratchets (and breaker bars), we use the actual working length (center of drive tang to end of handle), not the overall length of the tool. This avoids any misleading overstatement of size or capability caused by the difference between these measurements. As a result, Tekton tools may be a little longer than other similarly described tools in the market. We designed a sleek and simple handle that considers the many ways your hand interacts with the tool, from holding the very end of the handle for maximum leverage to grasping around the head itself for quick spinning, and anywhere in between. It's completely circular in cross section along its entire length, with a straight, non-tapering neck. The finger ring is generously sized, with pronounced interior edges for traction and control, and is useful for any finger placement, including a two-handed grip. The inside edge of the pommel is well-defined to keep your hand from slipping off the end of the handle, while its outer circumference is rounded, allowing you to comfortably apply as much force as needed. 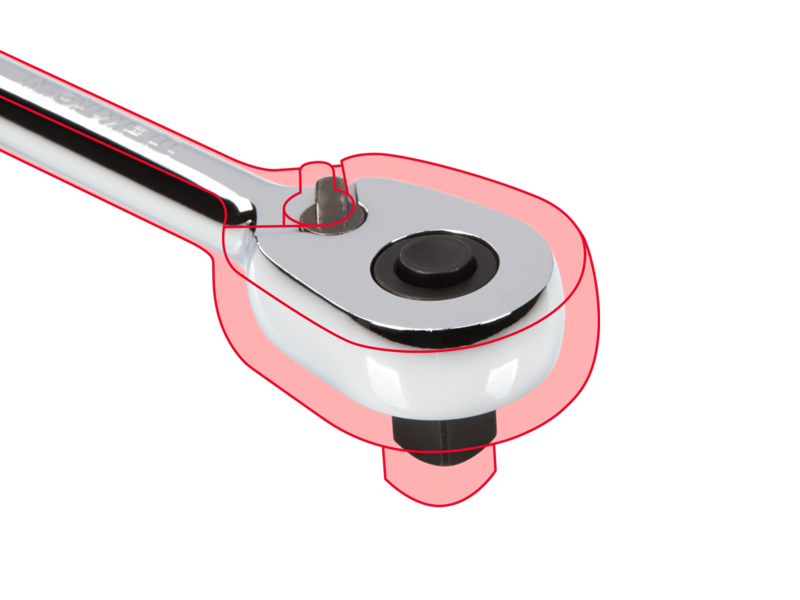 Our ratchets and breaker bars meet (and most far exceed) minimum industry standards for important baselines like Proof Torque, a measure of strength verified by a single-cycle test that applies torque until the specified value is reached without failure or any permanent deformation. D. Head Thickness 0.498 in. E. Working Length 4.5 in.